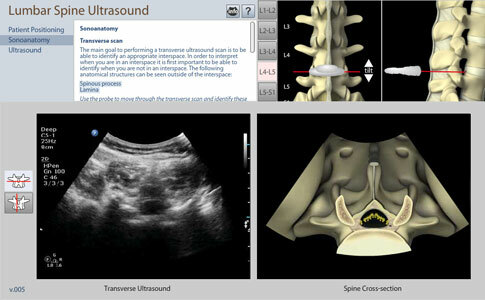 The Lumbar Spine Ultrasound module is aimed at teaching ultrasound-guided regional anesthesia for the lumbar spine. It includes an animation illustrating the flexion of the lumbar spine during patient positioning to open the intervertebral spaces, facilitating the insertion of needles into the spinal canal. The module also contains a section teaching the sonoanatomy of the lumbar spine and a final section currently under development which will allow users to perform a simulated ultrasound of the lumbar spine in preparation for spinal anesthesia. Dvorak J, Panjabi MM, Chang DG, Theiler R, Grob D. Functional radiographic diagnosis of the lumbar spine. flexion-extension and lateral bending. Spine (Phila Pa 1976). 1991; 16(5):562-571. Cargill SC, Pearcy M, Barry MD. Three-dimensional lumbar spine postures measured by magnetic resonance imaging reconstruction. Spine (Phila Pa 1976). 2007; 32(11):1242-1248. Hayes MA, Howard TC, Gruel CR, Kopta JA. Roentgenographic evaluation of lumbar spine flexion-extension in asymptomatic individuals. Spine (Phila Pa 1976). 1989; 14(3):327-331. Ng JK, Kippers V, Richardson CA, Parnianpour M. Range of motion and lordosis of the lumbar spine: Reliability of measurement and normative values. Spine (Phila Pa 1976). 2001; 26(1):53-60. Pearcy MJ, Tibrewal SB. Axial rotation and lateral bending in the normal lumbar spine measured by three-dimensional radiography. Spine (Phila Pa 1976). 1984; 9(6):582-587. Van Herp G, Rowe P, Salter P, Paul JP. Three-dimensional lumbar spinal kinematics: A study of range of movement in 100 healthy subjects aged 20 to 60+ years. Rheumatology (Oxford). 2000; 39(12):1337-1340. Yamamoto I, Panjabi MM, Crisco T, Oxland T. Three-dimensional movements of the whole lumbar spine and lumbosacral joint. Spine (Phila Pa 1976). 1989; 14(11):1256-1260.